California spikenard, Western aralia, or Elk clover (Aralia californica) in bloom. One of the largest herbaceous plants in North America — known by the botanical name, Aralia californica — can be referred to by any of its many common names: Western aralia, Western spikenard, California ginseng, or elk clover. Western aralia’s large, green leaves grow on thick, non-woody stems. This lush plant gracefully arches to a mature height of 3’-9’, but sometimes it can reach up to an impressive 10‘. That is very tall for an herbaceous perennial plant that dies back fully to the ground each fall, only to return the next spring from its thick, fleshy, snakelike roots, which are often embedded in rocks or streamside woody debris. The broad and compound leaves have a tropical look, but Western aralia naturally ranges from southern California to as far north as Linn County in Oregon’s western Cascades. 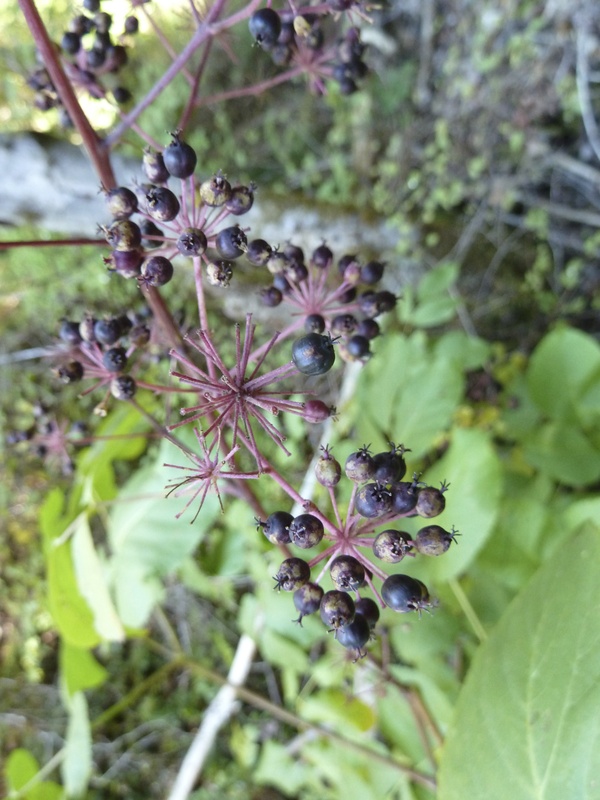 Aralia has an affinity for moist gulches, seasonal or perennial streambanks, canyons, and other cool, shady locations at elevations generally below 5,000 feet. Considering its relative tenderness, aralia is a very big and robust plant. In early to midsummer Western aralia produces ball-like clusters of greenish white, sticky flowers that mature into ornamental, dark purple berries in the fall. The juicy berries are about the size of peppercorns and have a pungent, ginseng-like flavor. The berries are reportedly loved by birds, but I only observe occasional use in my neck of the woods. One of the common names, elk clover, is a bit of a misnomer since aralia is not really a clover at all; in fact, it is a member of the plant genus Araliaceae, or the ginseng family. It is one of only two native plants in Oregon in the ginseng family; the other being devil’s club (Oplopanax horridus). 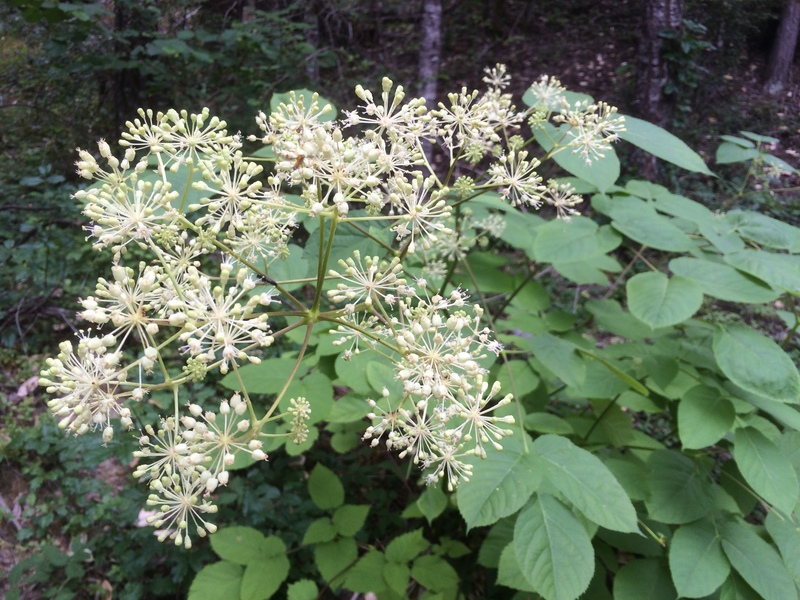 Western aralia is, however, the only member of the ginseng family that grows wild in the Klamath-Siskiyou Ecoregion. 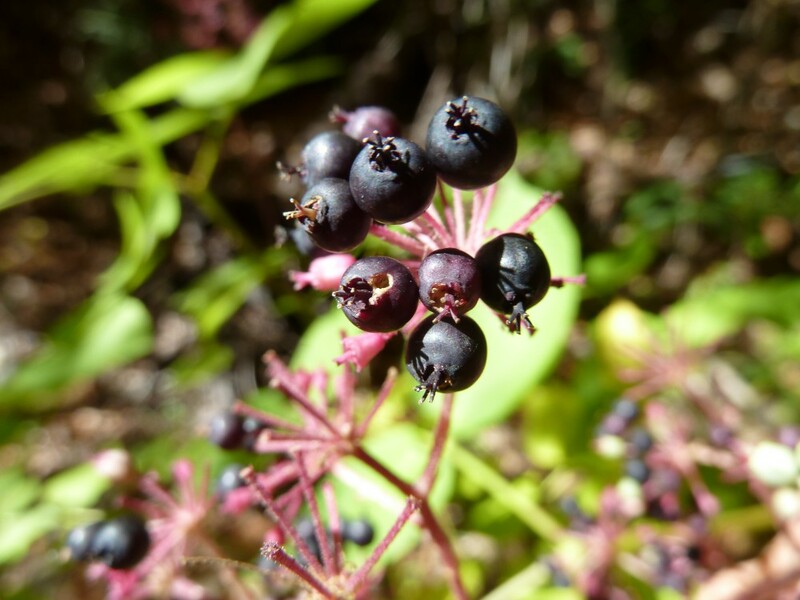 It is related to American spikenard (Aralia racemosa) and wild sarsaparilla (Aralia nudicaulis), known, as Western aralia is, for their many medicinal uses. In your garden Western Aralia will thrive in heavy shade as long as there is some moisture and the soil does not dry out completely. Aralia is robust and ornamental and can be grown in regular garden conditions. It is hardy to USDA zones 3-8. I am lucky enough to live near a seasonal gulch where Western aralia grows naturally, but nonetheless I have still planted it in my garden to enjoy its beauty and to more easily harvest plant material for herbal medicine. Before going dormant for the winter, Western Aralia produces a rich and creamy yellow autumn foliage that allows for a beautiful contrast to other fall colors in the garden or wild setting. Enjoy Western aralia in your garden! Aralia californica in bloom on the forest edge.